Last Sunday on a long and remote stretch of the Nelson coast, trampers encountered a stranded whale (or was it a dolphin) at the mouth of the Raukawa Stream. 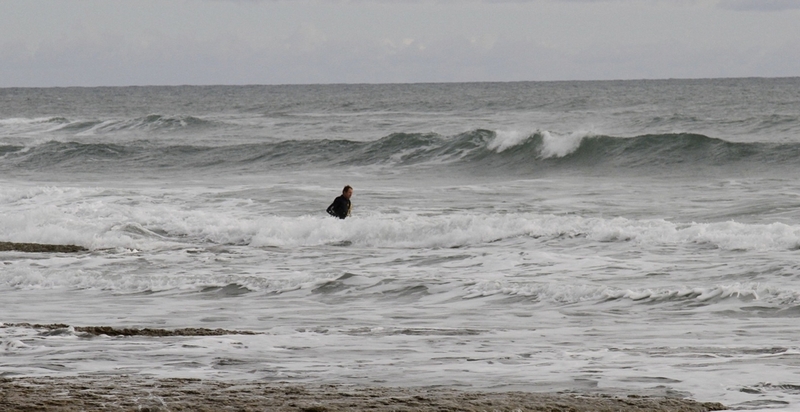 They managed to get it back into the water, but, due to a rising tide they had to leave it to fend for itself. 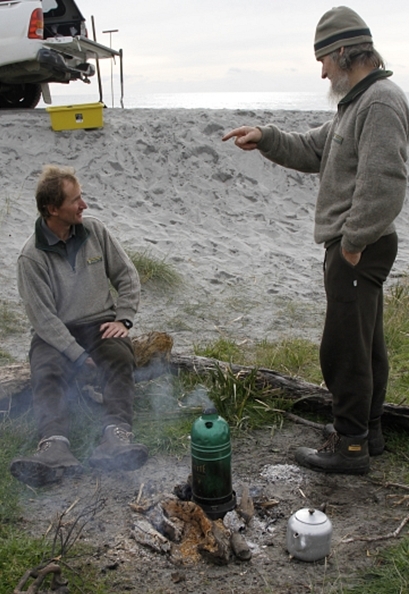 The dolphin discovered by trampers at the mouth of the Raukawa Stream. One of the trampers phoned the DOC hotline and the message was passed to me. We get a lot of stranded whales along our coast, especially around Farewell Spit. Most are pilot whales but we also get a fair mix of other marine creatures. After contacting one of the trampers his description of the creature, “grey, about three meters, had teeth, sort of had a dolphin head, but not really” piqued my curiosity. The report was unusual enough to act on – despite the two hour drive, three river crossings, limited vehicle access and possibility that it had just simply swum away. The weather and tide were good, so I headed west with a quad bike on the back of the ute. The ute got me through the first two river crossings fine and then I took the quad bike down the beach as far as the Anaweka River. To check if I could ride the quad across the river I started wading in, but half way across with water mid thigh and current racing I decided there was no chance. Losing a quad bike in the Tasman Sea would not be a good move, so I parked it and started walking. The exact location of the stranding was a bit vague and it wasn’t until I ventured well up into the Raukawa estuary that I could make out a pale outline amongst rocks. Unfortunately it was clear to see that the creature had died. But this was certainly something we hadn’t seen before. The first oddity was the scratches covering nearly every square centimetre of its skin. The next obvious feature was the forehead – there was long vertical cleft running up it. There was no sign of recent trauma around the cleft, or old scar tissue. Proportionately it also had a very large dorsal fin for its size. I started flicking through the identification book. Dwarf sperm whale looked close, but the mouth was the wrong shape. The book had suffered from a few of its own strandings with lots of the pages were stuck together so I left it at that. I quickly took a skin sample for DNA, snapped some standard stranding photos, took a GPS waypoint and tied the mysterious creature to a tree. At home that night at home, flicking through another identification book, I found it! All the features added up, the toothed mouth, lots of obvious scarring, the narrow tail stock, large dorsal fin and the clincher – a cleft forehead. Not a birth defect, or boat impact – they all look like this! It was a dolphin – a Risso’s dolphin. 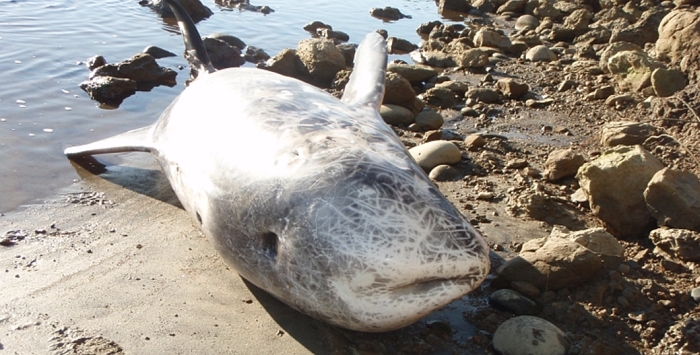 Rare this far south, this would be the first record for a stranded Risso’s dolphin in the South Island. I soon found the story of “Pelorus Jack” the famous Risso’s dolphin, who just over 100 hundred years ago was the first dolphin in the world to gain legal protection. And he had lived just around the corner in Cook Straight. By Wednesday interest in the dolphin had grown and Otago Museum was keen to have the specimen. The museum staff consulted with Manawhenua ki Mohua and gained their approval to take the dolphin. 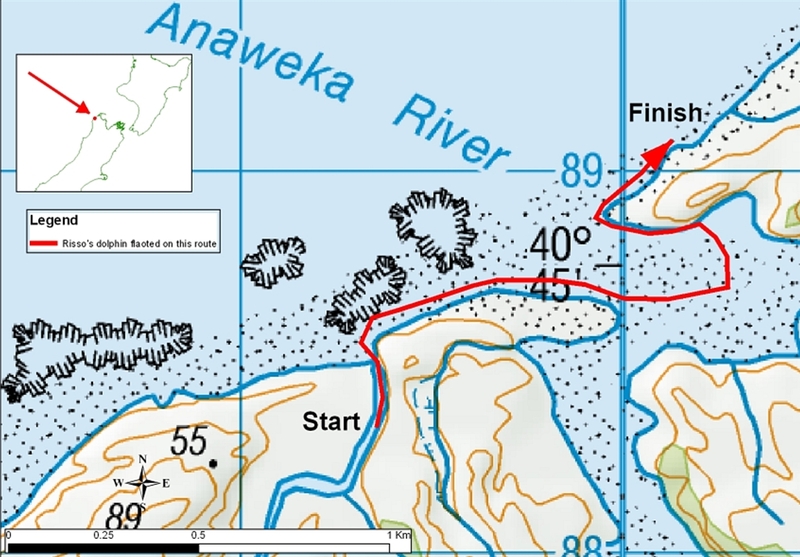 The plan was to drive as close as practical to the Anaweka River, walk south from there across river to dolphin, tie a rope around it and float it two kilometres back to the vehicle over high tide. In the summer two of us had floated a two tonne sei whale a kilometre across an estuary. So how hard could it be for one person to float a little 300 kilogram dolphin? I got to the dolphin about 11 am, fortunately still tied to the tree and only just out of the water. After dragging it into the Raukawa Creek it floated well and I headed for the estuary mouth. Soon the dolphin grounded in a shallow part of the estuary. A bit of digging sand by hand got it to the next bit of deep water. After ten minutes we were on our way to the estuary mouth. The Anaweka is quite large at high tide. Looking across the river mouth I wondered what my career prospects would be if I lost a dolphin in the Tasman Sea. Discretion is the better part of valour, so I waded about 200 metres up the estuary away from the mouth before attempting to cross. Across the channel I climbed, waded and swam, then over a rocky headland before I finally emerged at a rock shelf 100 metres from the vehicle. Here, once the tide had receded, my colleagues helped me roll the dolphin onto the ute. Our day was done, and the dolphin was on its way to Otago Museum. Now science could have its day.